I do not pride myself on being ahead of culinary trends, or even knowing when one has come and gone. However, I read enough food magazines and go out to eat enough to realize that we really are seeing a trend of casual/street food turned gourmet. Restaurants serve gourmet $20 burgers with fois gras, hot spots are touting fancy wood-fired pizzas wearing brussels spouts and pistachios and taco joints are serving up the traditional Mexican fare stuffed with braised short ribs and kimchi. But one of the most fascinating trendy spots I have seen is a restaurant downtown that showcases what a dressed up hot dog can really do. And this place really does the job – a turducken dog, a croque monsieur with ham and bechamel, and a Chevy Chase complete with pretzels and beer cheese. At first I was skeptical – that is until I actually had one of these exhibitions of gourmet picnic food. Who knew a hot dog could be so multi-dimensional. And, as a home cook, it has opened my eyes to what “dressed up casual food” I could make on an average weeknight. 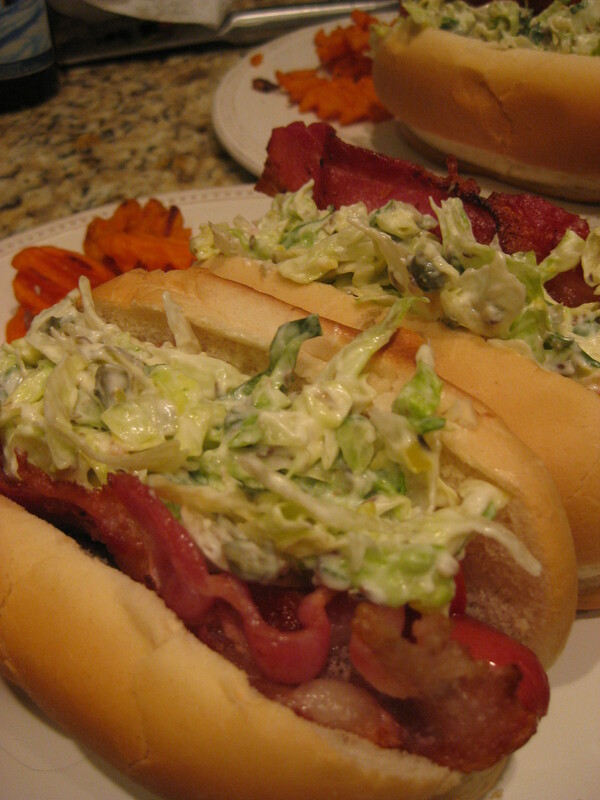 So, when I saw a recipe for a BLT hot dog with caraway remoulade in my Food and Wine magazine, I thought why not? It is quick (easy for a weeknight), cheap (how much can all beef dogs really be?) and completely unique (not sure who decided to put bacon on a hot dog, but that person should win a Pulitzer Prize). I cannot rave enough about this super simple recipe that tasted exactly like a BLT (but a bit better, to be honest!). The lettuce mixed in the homemade remoulade really makes the dish, so make sure to get a bite of it along with the dog, tomatoes and bacon. This is surely going in my recipe book not only for an easy weeknight standby, but also to really mix up my next grill out. Who said picnic food can’t be a little fancy? In a medium bowl, whisk the mayonnaise with the shallot, capers, pickle and toasted caraway seeds. Put the cooked hot dogs in the buns; top with the bacon and tomatoes. Toss the lettuce and basil with some of the caraway remoulade. Top the dogs with the slaw. Serve any remaining remoulade on the side. This entry was posted on January 27, 2013 at 6:34 pm and is filed under Beef, Grilling. You can follow any responses to this entry through the RSS 2.0 feed. You can leave a response, or trackback from your own site.